Hi there – I have a new release, the Steeplechase Pearls! I’m offering the pearl set in silver for only $55L just for Moody Mondays. So check them out and stop by at Dark Mouse today. Here’s your taxi! Hello my friends, I’ll be participating in a new weekly sales event called Moody Mondays! 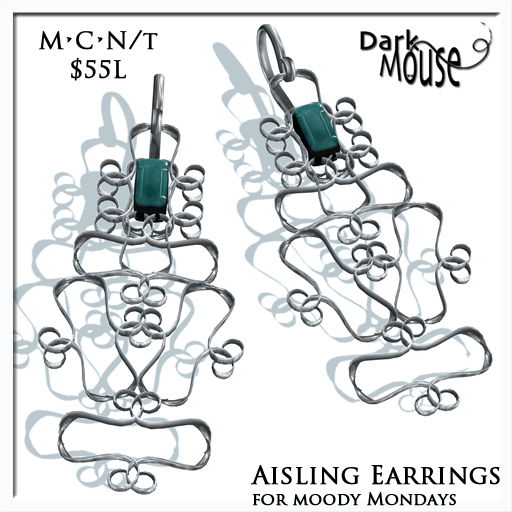 For this week I’ll have out some new earrings, the Aisling Earrings for only $55L. You can pick them up in the store at the reception counter, enjoy! Click this link to teleport directly to Dark Mouse! I’m an oldbie. Just letting ya know that I’ve been around in SL since 2006, and I think its probably about time to accept my oldbieness.. I know I am because there are people in SL who have NEVER heard of the Free Dove. Back in the day, the Free Dove was the place to get your look on. A large collection of FREE jewelry, hair, skin, and clothing can be found there. There were other places (the Gnubie Store comes to mind), but the first place I went, and sent my newly made friends for ‘stuff’ was the Free Dove. The Free Dove is run by Palomma Casanova – and with the demise of the Gnubie store, needs a big refresh! Because I remember, and remember fondly, my visits there, I’ve decided to help out at the store (which still gets A LOT of traffic) by donating two items, exclusive to the Free Dove! 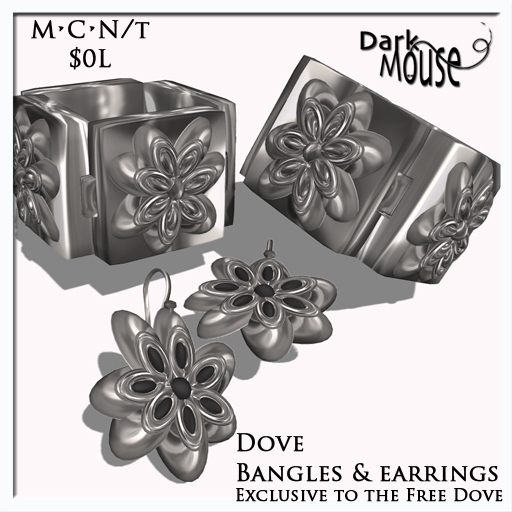 I have out there a new bangles and earrings set, I’m calling Dove. I’ll also have a new hair style out – Palomma. If you’re a designer in Second Life, and can remember when, I urge you to donate a new and exclusive item to the newbie store. If you are a MAJOR hair or skin designer, I urge you to donate hair and skin – since I’m certainly not the best, and the selection of hair there currently was lovely back in the day, but now needs a bit of upgrade. If you’re interested in donating, drop a notecard on Palomma Casanova. Here is a teleport to the Free Dove, these items are available for free there right now.